Just like a horrific accident, I was interested in just how "bad & tasteless" it was, especially with all the to-do around how Kickstarter canceled it. Plus even if it wasn't that great of a game, the novelty alone made me want to pick it up. Unfortunately, by the time I was ready to buy it, the game was sold out from Soda Pop's web store. Lucky for me, a friend of mine was headed to PAX and was able to snag a copy of it. Its not a surprise that I enjoy the crap out of this game. The humor is right up my alley. While there has been a lot of uproar about the theme of the game. There is no violence here and its all very tongue-in-cheek and innuendo filled. I was super happy to get my hands on the game. But sadly, she was unable to get a hold of the two special edition miniatures of Candy and Marie-Claude. 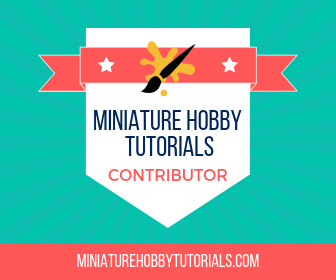 Luckily, Soda Pop has decided that they are going to stay away from exclusive or limited edition miniatures. Which means, they are available on their store once again! But, they tend to sell out a lot. I'd spent a few months watching for the minis to arrive back in stock and debating on ordering the foil card pack to add to my game. But then, Soda Pop announced a brand new deal. To celebrate the 2nd printing of Tentacle Bento and the release of their new card game, Karate Fight!, Soda Pop offered a bundle. In the bundle, you got the 2nd print run of Tentacle Bento, Karate Fight!, the Tentacle Bento foil pack and Bento Box, plus 4 brand new miniatures with their own additional Tentacle Bento cards! I had to have it, and for the early bird pricing of $60 I had to jump on it. The new minis are all pretty solid as well. But there is one that is a cut above the rest and that's the one forthe Tough Cookie Club. It might be because she's wielding a katana and a pistol.. or it could be because her shirt is wide open and has long legs. Either way, while I was waiting for things to dry on the Cyclopean Gemstone Heist, I needed something else to do. And while I could have painted something from Super Dungeon Explore, I decided to work on Tentacle Bento minis instead. 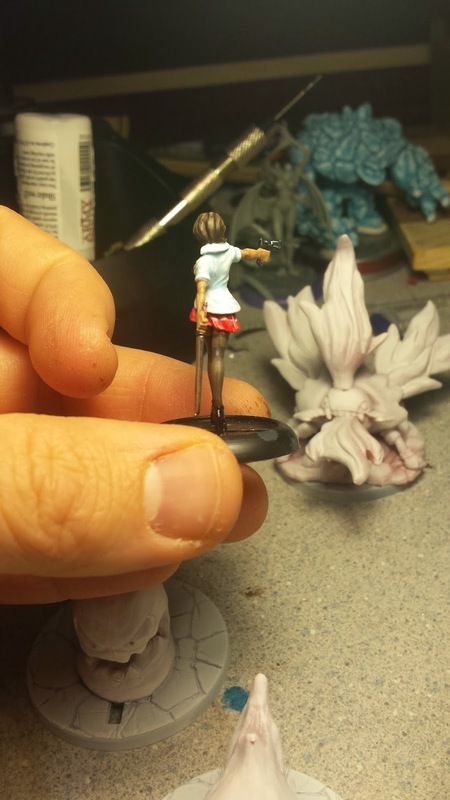 So I broke her open and started painting. I've been working on skin tones and smoothness as much as possible lately and on this one I knew I wanted a tanned skin tone. So I began there and worked highlights up as I went. But, I really wanted to attempt stockings on her legs. I think they turned out really well, and I even managed to get the seam down the back of the leg. 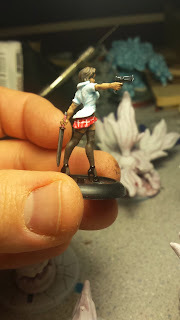 The next challenge was creating the plaid pattern on her skirt. Normally, I don't like following the official artwork. But with these minis I'm going to keep the school uniforms as close to the official color scheme as possible. 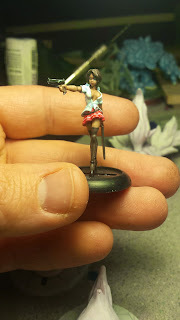 The only problem I ran into with this mini was that my brushes were getting old and worn out. I ended up fighting them more than working with them. 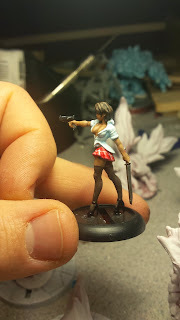 That and painting her shirt white was a pain, because I started with a grey base, and I think it should have been a light blue base instead. 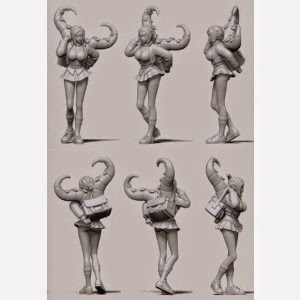 Either way, I'm glad I picked up the bundle and it looks like the original minis are back in stock over that their store now too. So I may need to pick them up soon. I'm sure I can. 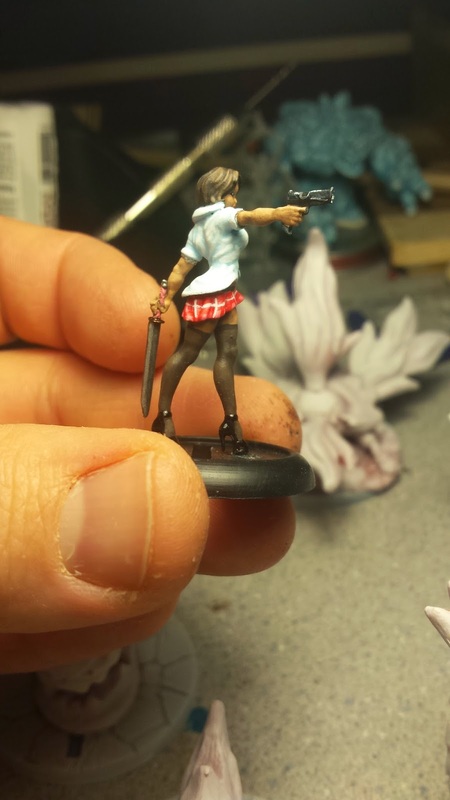 I really enjoyed painting that mini and wouldn't mind doing it again. I'll drop you a Facebook message after work. I tried to find you on FB but there are dozens of Scott Ferguson's in Michigan. Try this link instead. https://www.facebook.com/erika.philipp.7 to send me a message. I was also the character Verika in Tentacle Bento if you look at the special foil cards (I had long hair back then). Ha I'm not super active on FB and haven't really logged into my account in years. But I'm fairly active on Twitter (@ryglore) though. I did quickly check out your profile at lunch and saw the Tentacle Bento art and a pic, which I assumed was the basis for the Tough Cookie mini. Sending you a FB message now!